Home remodeling projects have never been easier to complete thanks to the variety of oscillating tools available on the market. Oscillating tools are extremely handy with home repair and construction around the house, because they perform a variety of functions that might otherwise take several other tools to do. They are the ultimate tools that every homeowner, contractor, and hobby builder should own and never fail to assist for all projects big and small. Currently, the two types of oscillating tools out there are cordless and corded models. While corded oscillating tools have the ability to get the job done, many hardworking home construction experts will choose to go cordless due to being able to move more freely around the work area. In addition to that, cordless tools make plunge cuts less complicated, and flush cuts in wood, drywall and metal a breeze. 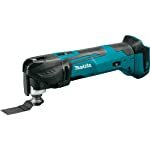 Below are a few cordless oscillating tool reviews to help contractors and DIYers of all skill levels make the best purchase they can for whatever type of project they are currently planning for or working on. All of these selected models are great choices, but ultimately their evaluations will give you enough information to help you select the best cordless oscillating tools for your needs. When it comes to buying your own hardware tools, you’ll want to know for sure that they will meet your expectations before putting the money down. Here are a few reviews to lay out the oscillating tool comparison to help you make the right decision. These picks were made based on closely collected customer feedback, data that evaluated their quality, and product features that were deemed the most essential. This top rated oscillating tool kit is the most expensive on the list, but you can be sure that you’re getting your money’s worth in the purchase. One of its most coveted features is the fact that it is built with the new StarLock Mounting system, which makes changing blades a quick and easy job with its “snap-in” tool-free accessory change technology. The battery life is fairly long too, which causes fewer interruptions during working hours. The only drawback to this product is the fact it is quite costly compared to its competitors, but as mentioned previously it’s also very high quality and will last you for years. This might be the perfect cordless oscillating tool kit for you if there are lots of home repair, remodeling, or construction plans in the near future. 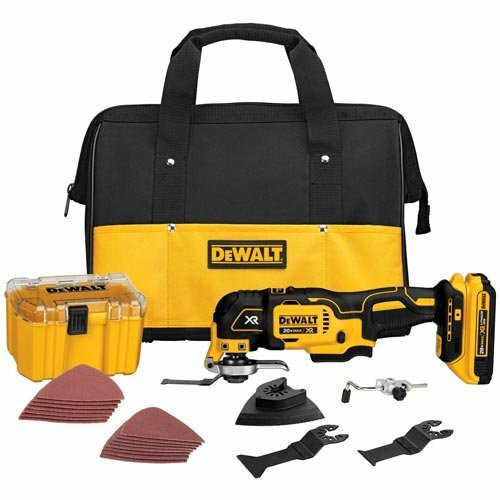 The DEWALT cordless oscillating tool kit comes with 28 accessory pieces and a storage box complete with cutting and sanding attachments, which makes it perfect for homeowners who don’t own any other multi-tool equipment. Given that this tool is so versatile makes it easy to rely on for many different types of remodeling projects. With a voltage of 20, users can be sure that there is enough power from the battery to get a lot done in a single sitting without it dying at an inconvenient time. Also, many customers appreciate the fact that this is an XR tool, which means that it creates less friction and is more efficient in the long run. The Dewalt brand is highly reputable and comes with a lot of different pieces for diverse home repair and remodeling projects. This popular oscillating tool is generally loved by the home improvement community due to the fantastic power and efficiency of its motor. 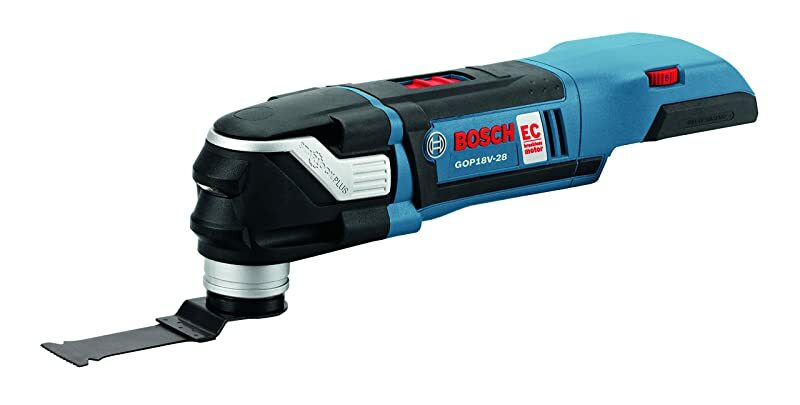 The variable speed of this Bosch cordless oscillating multi tool ranges from 8,000 to 20,000 OPM (Oscillations Per Minute) and is masterful at sanding, grinding, and scraping surfaces made from several kinds of materials. In addition to that, it is specifically designed to be great for plunge cutting, flush cutting and removing grout with ease. Unlike many of its competitors this model does not include a charger or battery, however, the quality and user-friendliness of its design have more than made up for that factor. This is the ideal oscillating tool for those who may need one with a bit more power for bigger projects, and are willing to purchase a separate battery or charger. This pick as a best oscillating tool is intended for those who might already have a kit and extra accessories. Even though the tool does not come with anything additional, it is very affordably priced and a high-quality item. The 18-volt lithium-ion battery is powerful and has the ability to function for up to 20 minutes of continuous use, and is equipped with a variable speed dial that ranges from 6,000 – 20,000 OPM. In addition to that, the durability of this item proves it to be ideal for anyone who has to do home improvement projects, repair work, or construction on a regular basis. Only comes by itself, no extra accessories are included but can be purchased separately. This Makita oscillating tool is perfect for veteran users and priced fairly without lacking in quality. 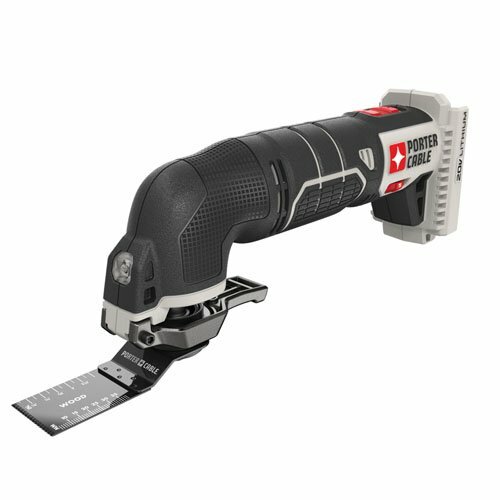 This Porter Cable cordless oscillating tool conveniently comes 11 accessories, a storage box, and a LED work light for those dark spaces and dim lit rooms. The 2 Finger Tool-Free system makes it easy for first-time users to change accessories and learn how to use this product in a number of different ways. Some additional features that have been found highly favorable are the fact it has a variable speed range of 8,000 to 18,000 OPM. The price range is also one of the most affordable on the market for this kind of kit, and it’s a great bundle considering it comes with so many extra pieces. 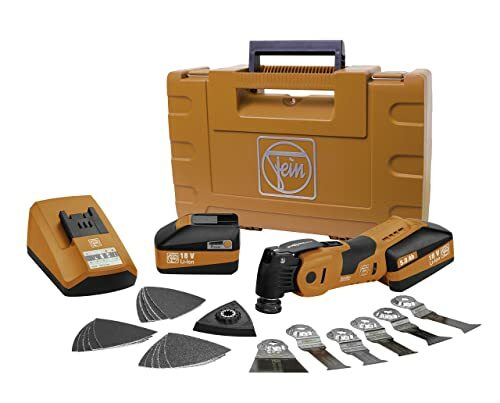 This great multi-tool kit is ideal for anyone looking to buy a cordless oscillating tool for the first time. The price is very economical, and it comes with lots of parts to introduce any homeowner to its versatile abilities. Choose the Best oscillating tool blades here! If you’ve been shopping for your own cordless oscillating tool, look no further than these top five products. Customers and home remodelers from all over the globe have tried and tested these tools and have given the feedback that they are truly the best options out for sale right now. Based on our best cordless oscillating tool reviews, anyone should be able to find one that meets their needs, wants, and expectations for all upcoming and current projects.